In early November, we said that far from the traditional risk factors affecting China's economy, including the slowing economy, the stock market (and now housing 2.0) bubble, the soaring NPLs, and record debt, the most under-reported risk facing China is the "breakdown in recent "agreeable" labor conditions, wage cuts and rising unemployment, leading to labor strikes and in some cases, violence." 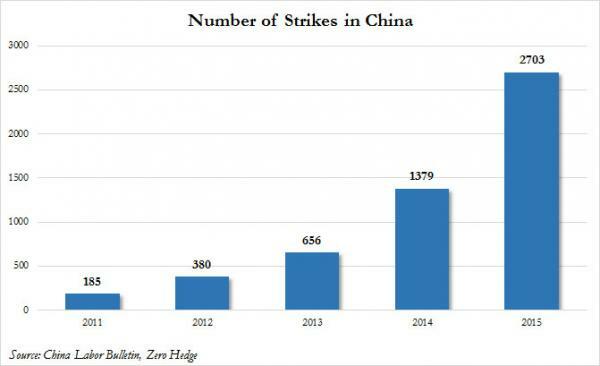 While so far most Chinese worker strikes had been largely peaceful, two weeks ago we said it was only a matter of time before these turned violent after Reuters reported that "China aims to lay off 5-6 million state workers over the next two to three years as part of efforts to curb industrial overcapacity and pollution." All this changed overnight when as AFP reports, thousands of miners in China's coal-rich (or poor depending on one's perspective) north have gone on strike over months of unpaid wages and fears that government calls to restructure their state-owned employer will lead to mass layoffs. "I'm on my knees, my family can't eat," an elderly woman pleaded with a man who appeared to be a government official. "Tell me, how can we live?" she shouted, before collapsing and being rushed away by fellow protesters. In the video footage from Heilongjiang, dozens of police cars, lights flashing, lined the streets, and protesters complained of violence by authorities as tensions mounted. "Traffic in the centre of Shuangyashan city was halted," a witness told AFP, adding "some people were hurt". Striking miners held large banners demanding back pay. "Their main request is to get the delayed incomes from the past several months," the witness said. The catalyst for the miners' anger spilling over into street was Heilongjiang's governor Lu Hao saying that the company owed employees no back pay. Over the weekend the provincial government admitted that workers' compensation was in "arrears" following "many years of accumulated problems". As a result, "not a few workers have encountered difficulties in their lives", it said. The implication was clear: either the government gives another bailout, or no wages will be paid. The statement blamed the company's financial woes on inefficiency, saying that it "uses three times as much labour as the national average to produce 10,000 tonnes of coal", resulting in "heavy losses and diminished cash flow". Incidentally, this is the same coal Longmay Group mining company we profiled back in September when we wrote "The "Hard-Landing" Has Arrived: Chinese Coal Company Fires 100,000." The firm said it was "resolutely battling" to implement reforms, it said. China's coal industry has been particularly hard hit as the country's growth slows. Consumption of the heavily polluting fuel fell 3.7 percent last year, according to China's National Bureau of Statistics (NBS), after a 2.9 percent decrease in 2014. AFP adds what we have been warning about for months: "the situation in Heilongjiang exemplifies the dilemma faced by Chinese authorities, who say they want to reform the world's second-largest economy and at the same time seek to avoid unrest." Earlier this month Premier Li Keqiang again pledged to encourage "structural adjustments" in his opening speech to the annual session of China's Communist-controlled parliament. Judging by the predicted confirmation violenece, the only adjustments China has in place is a massive police force trained to break up precisely such protests, something we further showed back in May 2014 when we demonstrated how "Chinese riot police train for a "working class insurrection."